Architecture studio Morris + Company proposes transforming a London Underground station into a co-working space and hostel for homeless people. 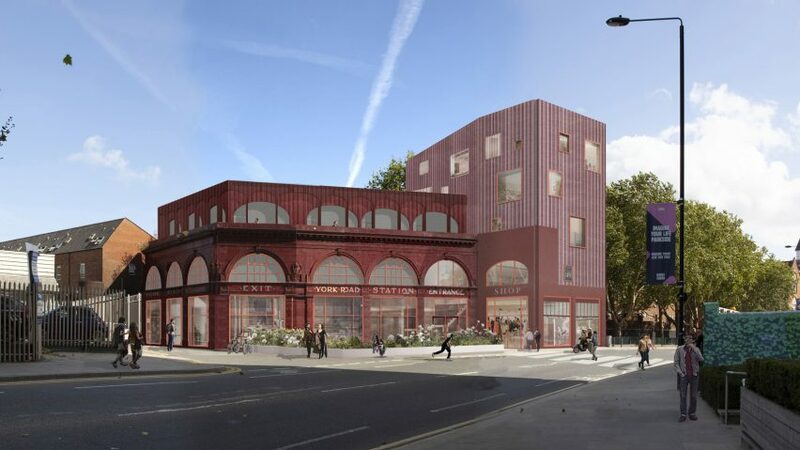 Morris + Company – formerly known as Duggan Morris Architects – won a competition run by New Horizon Youth Centre and the London mayor's office with its proposal to reimagine the disused York Road tube station as housing for the city's homeless. Named Stepping Stones, the design combines temporary accommodation for people living rough with co-living and co-working space for young people starting out in the city. A charity shop on the ground floor would provide the scheme revenue. "It supports homeless young residents temporarily whilst also catering for a transient community of young professionals finding their bearings in London," said Morris + Company, which is led by architect Joe Morris. "Each resident is treated with equal dignity, and all living spaces have been designed to follow the same 'ingredients for living'." Morris + Company believes that combining the accommodation for homeless people with co-living and working spaces for young people will make the building a key hub in the community. "The hidden homeless are no longer hidden but are supported at the centre of a vibrant community rich with opportunity," continued the studio. Design addresses "hidden face of homelessness"
The competition, which asked architects to propose innovative approaches to housing for homeless young people in London, was judged by a panel of experts including John McAslan, chaired by Channel 4 News anchor Jon Snow. "The winning proposal by Joe Morris [founder of Morris + Company] and his team offers a flexible combination of accommodation with a 24-hour active ground floor area, providing both a sense of community and the necessary commercial revenue," said Snow. "Young people are the hidden face of homelessness, often sofa-surfing or sleeping on buses, in transient housing or shelters," added McAslan, executive chairman of John McAslan + Partners. "The winning mixed-use scheme for the Hidden Homeless competition by one of the UK's most impressive architects demonstrates an imaginative and pragmatic approach to this challenging project." London is currently in the midst of a homelessness crisis. The number of people sleeping rough on the streets of the UK's capital has doubled in the past five years, with homeless charity Crisis' latest figures showing that 6,180 people are sleeping rough in the capital. Dezeen spoke to two rough sleepers for a report before Christmas. "Young Londoners are suffering some of the worst effects of London’s housing crisis, with many ending up sofa surfing or in some cases with no choice other than to sleep rough," James Murray, deputy mayor of housing and residential development at the mayor's office. "The competition entries propose some innovative, creative and sustainable approaches, helping ensure young people have a safe place to stay while they find longer-term solutions. I very much hope these entries will help lead to new projects that provide much-needed shelter and support for young Londoners." Alongside Morris + Company's winning proposal, RCKa's Manual to Solve Homelessness was awarded second place, and Catja De Haas with Office Ten, Erika Suzuki, Anders Luhr and Rosie Bichard were given the third prize. Adam Khan Architects received a special mention for its entry. Another 10 practice's proposals were also shortlisted: Amos Goldreich Architecture, Askew Cavanna Architects, Inside Out, Jonathan Tuckey Design, Levitt Bernstein, Mitchell Eley Gould, Nicholas Hare Architects, Patalab Architecture, Studio Yu and Weston Williamson + Partners.